Norton University was formally founded as a university by sub-decree on September 18, 1997 and a further sub-decree of July 25, 2000 approved its reformation, giving it the “right and privileges” to open faculties, departments, and conduct postgraduate and doctoral degree courses or any professional courses as required by the society and the country. On July 25, 2000, the Norton University diplomas (degrees) were also accredited by the Ministry of Education. On August 31, 2007 our Foundation Year Course received full accredita­tion from ACC, allowing NU to issue certificates to students who successfully completed Foundation Year Course in 2006-2007, 2007­-2008, 2008-2009, and the following academic years. The ACC is a governmental institution under the authority of the Council of Ministers. 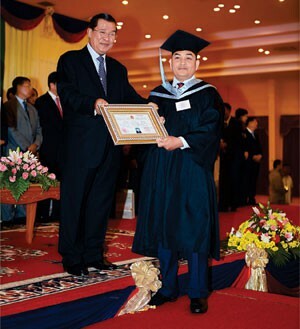 The main objective of this institution is to promote the quality of higher education in Cambodia.